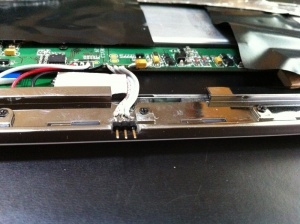 The Serial port on the White literati model #1637287 is located on the right side of the device seen in the picture on the right. this is also true on the older black models. 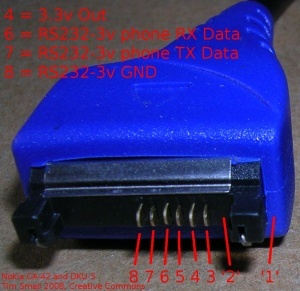 currently we do not know where they are on the newer models a picture of a newer model is also on the right and circled is what is believed to be the serial port. Once connected this will enable access the bootloader and start up processes of the linux kernel. 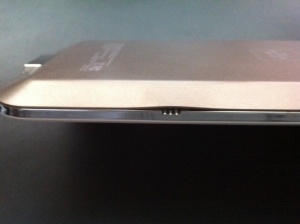 another option includes the use of a 1/8" audio jack which can be easily mounted by drilling a hole in the back cover. 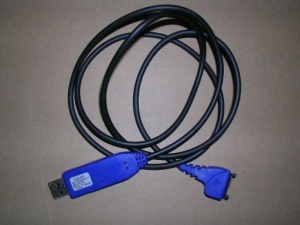 One of the simplest way to connect your PC to the Literati serial port is to order a Nokia CA-42 Data Cable from DealExtreme. 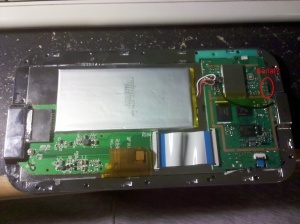 When you receive it, you can cut it open to find 3 or 4 wires depending on the revision. 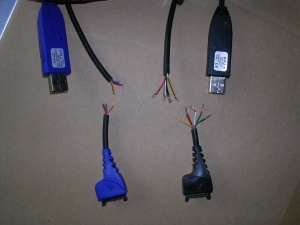 If you have three wires, then you will find GND, RX, and TX. If you have four wires, then the fourth wire is +3.3V. The example CA-42 only has three. 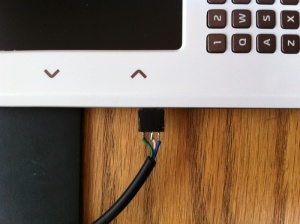 The cable can be soldered to a female pin header so it can connect to the male pins used to expose the serial port to the outside. during the boot process there is a 3 second count down to allow a user to enter the bootloader before booting the kernel. To get out of the bootloader right now you type "reset" and the device will reboot allowing you to get out of the bootcmd line there is a way to boot from nand but iv forgot to log the offsets.